Companies in semiconductors, medicine, and consumer electronics—such as Applied Materials and NXP—are building devices that will change our bodies, the environment, and transportation. The world around us will soon be engulfed by machines that affect our living spaces, our bodies, and our experience of light and sound, powered by a novel combination of semiconductors and miniature engines. Tasks as basic as charging a smartphone or cooking an egg—and as complex as scanning for colon cancer or powering flying drones on long journeys—stand to be transformed. Sensors gave machines the ability to perceive things like light, altitude, and moisture by converting stimuli into ones and zeros. The coming revolution will be filled with what are called “actuators,” which do the reverse. They allow machines to simplify our world by converting those ones and zeros back into some form of force, such as light or magnetic waves, or even physical pressure that can push objects. The actuator, like the sensor before it, is part of technology’s relentless quest to make machines do more and more things with greater and greater efficiency, as epitomized by the microprocessor, the most efficient information device ever made. 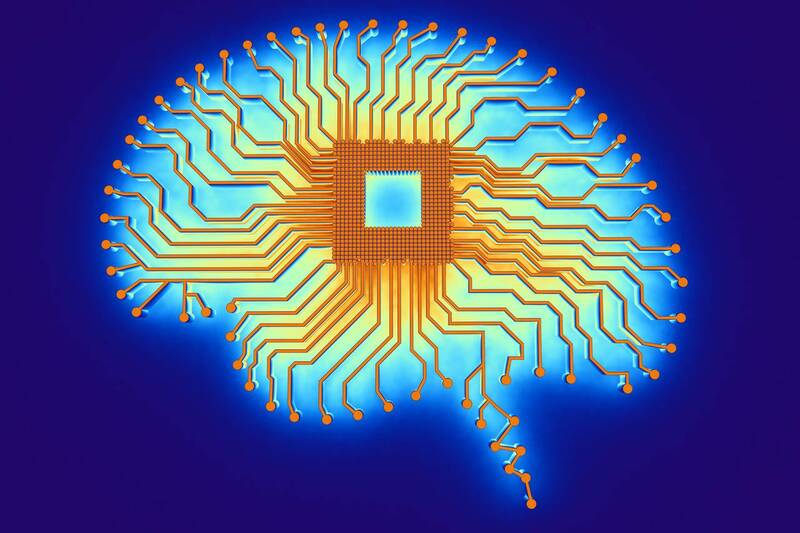 “We’ve spent the last five decades building the brains of the computer,” says Paul Saffo, a Stanford University adjunct professor in the mechanical engineering department, referring to the perfecting of the microprocessor. Now it’s time to give those brains the corresponding brawn to affect our world. “You can basically look at anything that’s bulky and make it smaller and cheaper,” says Saffo. As a result, whole industries will be reshaped. The market for fossil fuels, for example, will suffer a new setback, as power for your electric vehicle can be delivered from a simple charging plate that works in much the same way your Apple Watch gets juiced up in its cradle. The life-sciences market will have to adjust to a world where tests can be performed and therapies delivered from a capsule you swallow to detect cancer. And robots that use actuators to move parts with great precision—and can be recharged wirelessly—will take on more manufacturing tasks. Winners in this faster, better, smarter world will be companies such as Applied MaterialsAMAT in Your Value Your Change Short position (ticker: AMAT), the world’s largest maker of semiconductor manufacturing equipment, which is developing ways to engineer novel materials to move energy more efficiently. And old analog-chip companies, such as Integrated Device Technology (IDTI) will gain new relevance for their ability to master the movement of power. Newly public stars, such as wireless-energy firm EnergousWATT in Your Value Your Change Short position (WATT), could gain prominence as their wares become reality. 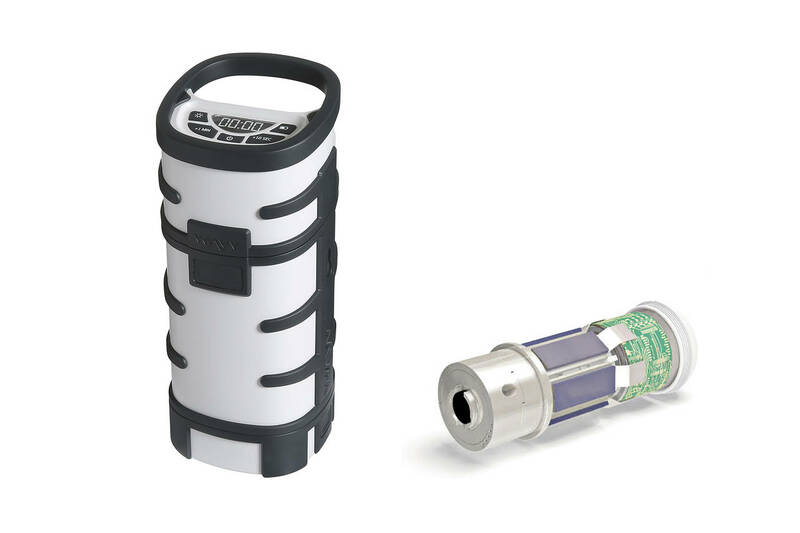 Many more of the companies shaping the actuator revolution aren’t yet public. Take a bulky device like a microwave oven. In a conference room at the offices of chip maker NXP Semiconductors PI in Your Value Your Change Short position (NXPI) in Chandler, Ariz., several cooking appliances are assembled for a demonstration. NXP’s Dan Viza, who runs the company’s emerging-applications unit and its “RF cooking” effort, wants to show how his chip can produce magic, by cooking an egg. You can’t cook an egg in a microwave. The magnetron, the device that emits the microwaves, blasts the egg with such force that it bursts. Viza’s appliance, which looks like a conventional microwave oven, has been retrofitted with a power amplifier, a chip that NXP has sold for years. It is used in cellular base stations to send RF signals to your phone. In an oven, the power amp is an actuator that stimulates the molecules in food with microwave radiation. But it is able to continually vary the intensity of that radiation, unlike the uniform radiation of the magnetron, and dial it back when a substance is more delicate. Out of the oven comes the transformed egg in its little dish. A single bite reveals it is firm, not succulent, but also not rubbery—somewhere between a boiled egg and a coddled egg, and entirely edible. This is not a new technology, per se. NXP has been selling power amps for years. But it wasn’t until 2014 that the company was able to make one efficient enough to convert electricity to heat in a fashion matching the exacting standards of appliance makers. Shares of NXP are up about 20% in the past six weeks amid speculation the company will be bought by wireless-chip maker QualcommQCOM in Your Value Your Change Short position (QCOM). The deal may be announced as soon as this week. Unlike the NXP chip, some actuators will need a breakthrough in semiconductor material. One of the most promising is made of a compound of gallium and nitride, referred to as GaN. It’s far more efficient than silicon at converting the movement of electrons into energy radiating outward. GaN has acquired more and more fans. A start-up called Soraa, based in Fremont, Calif., has used the technology to develop new kinds of LED light bulbs that emit light with a much broader spectrum. Under their glare, colors appear much richer than with typical LED lights. An NXP-powered portable microwave oven, developed with Wayv; inside the Check-Cap colonoscopy pill, showing an X-ray source and Xray detectors. The EPC GaN chip is placed in the Check-Cap pill that the patient swallows, with no fasting required. Once inside the body, the GaN chip detects photons bouncing off the colon wall as the tissue is exposed to X-rays. Those photons can be used to produce a “contour map” of the colon in 360 degrees. The photon data is sent to a wireless receiver the patient wears. “Polyps protrude inward into the colon, and those irregularities can be displayed when we look at that map,” explains Densel of the polyp and tumor hunting. The Check-Cap test is expected to cost around $600, compared with $1,200 or more for a colonoscopy, not including the anesthesiologist’s fee. Check-Cap is preparing a series of clinical studies, to culminate with a Food and Drug Administration study in 2018, which could be completed the following year. The company has enough cash to take it through next year after doing a registered direct public offering of shares in August, says Densel. Check-Cap, it bears noting, is still a development-stage company with a stock market value of just $23 million. EPC is working with another firm, whose name Lidow can’t disclose, that is developing an artificial heart powered wirelessly, eliminating the need for wires extruding from the organ into the patient’s body. 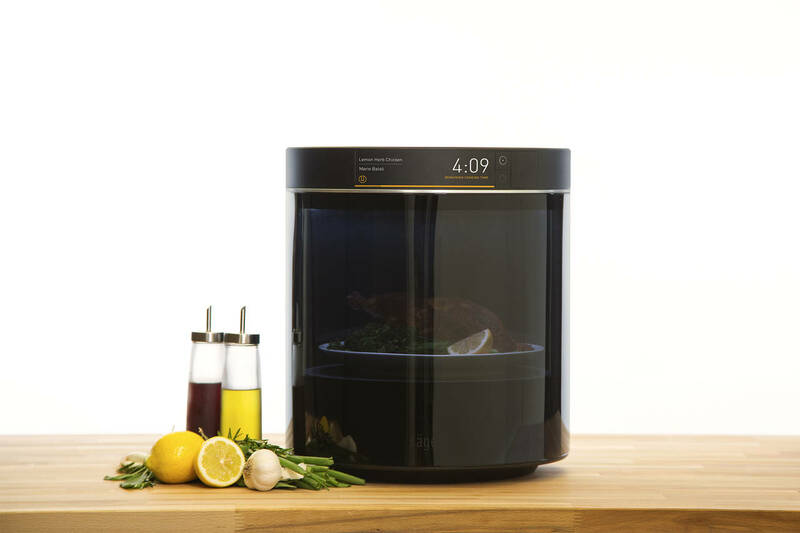 The prototype countertop microwave oven, designed by NXP and Frog Design, could be the only cooking appliance one needs. Another use is being developed by Israeli start-up BlueWind Medical, a subsidiary of Rainbow Medical. BlueWind makes a “neurostimulation” device that wraps around nerve endings and “tunes out” pain by generating a minute electric field at the synapse. It can be activated by patients for up to eight hours a day to relieve pain via a wireless controller outside the body, and is meant to be an alternative to taking opioids. EPC has deals with most of the companies making what’s called wireless power. One is the aforementioned Integrated Device Technology, which makes parts for “magnetic inductance.” By sending a charge to a magnetic coil, energy can be passed to another coil placed in contact with it. That’s the way your Apple Watch gets power from resting on a small pendant. DT in Your Value Your Change Short position To date, IDT has sold over 70 million chips, for such wireless-charging devices, giving it the dominant share of the electronics inside them. INDUCTANCE HAS A LOT OF RUNWAY, says Sailesh Chittipeddi, IDT’s chief technologist. “I would say a few more phone guys adopting it will get it in the several-hundred-million-unit range,” he says. As with the sensors, cars will be an important test bed. Vehicles are filled with more and more electronics, such as the giant 17-inch video dashboard in a Tesla, and on-board cameras. All that brings with it more wires to connect all the chips. Almost a third of a vehicle’s weight is the wiring between all of its parts, says Chittipeddi. More ambitious is something called magnetic resonance, which can operate without contact. Here, Lidow’s firm is working with a number of outfits, including WiTricity of Boston. Its founder, Marin Soljacic, a professor of physics at the Massachusetts Institute of Technology, figured out a way to tune magnetic coils to transmit energy between them far more efficiently, says CEO Alex Gruzen. WiTricity has a deal with a major notebook manufacturer for the capability, coming soon, he says. It is also working with auto makers to deliver kilowatts of power wirelessly. “Imagine a pad on the floor of your garage where your car just starts charging automatically” as you roll over it, at a distance a foot and a half from the floor to the bottom of the chassis, Gruzen says. IDT’s and WiTricity’s focus on charging by contact, or charging at small distances, isn’t sufficiently ambitious for some. The aforementioned Energous, run by wireless and semiconductor veterans, believes that by using RF power, similar to NXP’s oven, it is possible to send charges zipping all the way across the room at distances of up to 15 feet from your device. Charging in this way wouldn’t be as fast as a cable, but it need not be, if transmitters are embedded in every surface around you and you can constantly tap into them. In that case, “from the time you are driving in your car to the time you’re sitting in your office, to the time you’re relaxing at home, you’ll be receiving power” for your wearable device or your phone, says Energous CEO Steve Rizzone. You’ll be continually “topping off” your device by sipping power, and there will be fewer times when you get all the way to zero and need desperately to plug into the wall. There are doubters. Some are professional, like VP of technical intelligence, Jim Morrison at Chipworks, a division of TechInsights, who says wireless power is as much as five years away. “It’s too futuristic, it’s not at all cost-effective today,” he adds. Then there’s the Seeking Alpha Website, which contains some Ph.D. thesis–style refutations of Energous’ technical claims. Rizzone speaks carefully. “Short sellers have been an issue,” he says. “They are very smart, and they’ve put together just enough accuracy to sound credible and create a level of concern, but we continue to overcome these issues.” Indeed, the stock has more than doubled this year and is up 56% since its March 2014 debut. “Because in the end, the technology is real, it’s safe, and we will receive FCC approval,” Rizzone says. The first products using Energous’ technology, which are scheduled to ship in the first quarter of next year, are contact-based chargers; contactless versions, with the ability to span a room, will follow, he says, sometime late next year. From RF cooking to GaN pills in your system to wireless charging, all these things will be helped or hindered by the way they’re fabricated, which is a job for Applied Materials, the world’s largest vendor of tools to Intel (INTC) and other chip makers. For example, automobiles have “heads up” displays in which an image is projected above the dashboard. They use tiny mirrors that are like infinitely small mechanical structures with moving parts, called micro-electromechanical systems. Car makers would like to have such mirrors made on the same piece of silicon as the control circuitry that drives the mirrors because it would save power. But to date, it hasn’t been possible. Applied has developed a way to integrate the two using another elemental combination, silicon and germanium, which it says is ready to be demonstrated to customers now. WHAT HAPPENS AS ACTUATORS, the sinews of the machine, combine with its eyes and ears, the sensors? Humans will see extreme benefits, especially in health care, but machines themselves may see the most advantages. For people, a sensor could detect one’s brain waves, and translate thought into a signal that makes an actuator move a limb, perhaps in the case of spinal or nerve damage. It’s similar to how scientist Stephen Hawking types on a computer by moving his eyes. More tangible is the prospect that electric vehicles, freed by wireless charging, will pilot themselves via sensors to the nearest charging station, with no need for a human to plug them in. Such a system of constant charging would obviate the need for high-capacity batteries, making it easier for electric power to compete with gasoline in transportation. It would also obviously further the progress of driverless vehicles. Similarly, robots with actuators built into them to manipulate objects could take over even more factory work. And flying drones could travel greater distances as charging stations on the ground beam power to them in midflight via RF transmissions. INVESTORS HAVE BECOME OBSESSED with the financial potential of apps on a phone that have all come about due to sensors—things like tracking your fitness routine, monitoring the weather in your location, and finding nearby businesses. But those investors are about to be surprised by the follow-on to the sensor, the actuator. Its ability to change the everyday environment will make the world around us as intriguing as the digital world inside our phones, and perhaps even more promising for investors. The SPDR fund tonnage increased again yesterday, and now sits at 967 tons. This is obviously good news for all higher gold price enthusiasts. Please click here now. Double-click to enlarge. Gold is attempting to stage a nice upside breakout from a small symmetrical triangle pattern. In the short term, whether a rally happens or not probably depends on what happens with the bond market. Please click here now. Double-click to enlarge this short term T-bond chart. Since the Brexit vote occurred, both gold and T-bonds have been drifting lower. Sometimes gold leads the bond market. Sometimes it's the other way around, but it will be difficult for gold to stage a major rally now without a bond market rally. In the big picture, inflationary pressures are rising significantly, and in 2017 a divergence in the gold-bonds relationship may start to manifest itself. Please click here now. Double-click to enlarge this long term gold stocks versus gold chart. Gold stocks have been in a long twenty-year bear cycle against gold bullion, and the cycle won't be over until money velocity and bank loan profits end their own twenty-year bear cycles. I've suggested that 2017 is the year that happens. When it does, gold stocks should enter a multi-decade bull cycle that I would argue is better termed a "bull era". Please click here now. CNBC commentator Rick Santelli recently flew into a rage when hearing the news that Janet Yellen may try to seek congressional approval to buy stocks. The average working class person in the Western world can't afford to live normally anymore, even when working multiple jobs. Janet's latest solution, horrifically, is to try to pump up the stock market even more than her predecessor already did with his crazed QE programs, and leave Main Street to rot. Some gold analysts may cheer for more useless QE and other silly central bank schemes, but these programs are highly deflationary for Main Street. From a demographics standpoint, the West is an ageing society, so by definition QE cannot fix anything. Attention gold stock enthusiasts: Inflating Wall Street and deflating Main Street does not create a bull cycle in gold stocks. It prolongs the twenty-year bear cycle. The bottom line is that QE is the disease, and rate hikes are the cure. Rate hikes end the madness of forcing an ageing society to move savings out of banks and into speculative investments to "promote growth". QE destroys the standard of living of the Western world's working and middle classes. It makes housing an investment rather than a place to live. It encourages crazed government bureaucrats to borrow even more money than they already have done. That money is then promptly wasted on ludicrous regime change and entitlement schemes. I have to wonder if the next program to "help" most of the Western world's citizens will be for central banks to buy food commodities. That would make food an investment and completely annihilate the financial state of most citizens. Would Janet Yellen call that, "good news for inflation"? I don't know. I would call it an act of lunacy. The only things that QE has inflated are houses and government bonds, and that is opening the door to an "endgame" type of scenario. Janet Yellen is going to have to face the fact that rate hikes are desperately needed to save Main Street from the government monster that is enveloping almost everyone, including the central bank. She's also going to have to face the fact that the rate hikes are going to be followed by more PBOC devaluation of the yuan. The latest yuan devaluation is already in play now, in advance of an anticipated US rate hike in December. There's not going to be any "making America great again". The demographics of America are the demographics of a dying empire, regardless of who is sitting in the big White House chair. At some point, Janet Yellen and the rest of the Western world are going to have to accept that the West is out, and Chindia is in, in terms of empire leadership "action". Rising rates fit well with an ageing society. It's just common sense. Rising rates stop real estate speculation and lower rents. Also, many senior citizens can't afford the higher property taxes that are now in play in this "healthy" real estate market. Going forwards, it's madness to believe that roughly 350 million Americans can compete against 2.5 billion hungry Chindians. In a nutshell, it's time for the West to retire from the empire leadership game, and enjoy that retirement. The government bond market Ponzi scheme must end, and the diabolical attack on America's elderly savers must end. Cowards attack the elderly, and Janet Yellen should think very hard about that fact at her upcoming rate policy meeting in December. I think Janet will do the right thing, not just in December, but throughout 2017. I'm predicting that she is ready to begin raising rates more consistently, which is what she should have been doing from the start of the 2015 calendar year. Please click here now. Double-click to enlarge this key GDX chart. 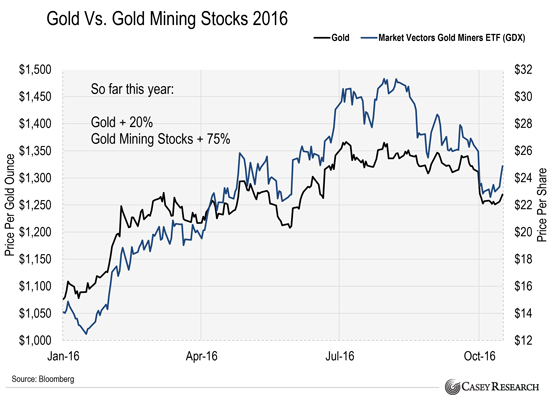 Like gold bullion, gold stocks appear to be "ripe for a rally". Note the position of my 14,7,7 Stochastics series oscillator, at the bottom of the chart, but please click here now. If Janet Yellen doesn't get away from promoting government borrowing and crushing savers, money velocity and bank loan profits are not going to recover, and gold stocks are going to go right back down to multi-decade lows against both gold and the dollar. Janet pulled the plug on QE, as I predicted she would. Now it's time for her to stop doing the bidding of a debt-soaked government. It's not time to make America great. It's time to make it normal, by raising rates in December, and consistently in 2017. If she does that, gold stocks, money velocity, and bank loan profits will all soar while an out of control government gets taken to the woodshed, where it belongs! Energy, technology, and financials still lead while staples, health care, and utilities lag. What to do now?. Wall Street wisdom suggests investors should worship at the Church of What’s Working Now. That means that despite what we think should happen, we need to restrict our activities to what is actually working. For investors, that means sectors in the stock market — such as financials — that are actually gaining ground. The broad stock market is basically a mathematical mash-up of each sector, and each sector, in turn, is a mash-up of its components. That means, of course, that it’s possible to have parts of the market moving higher and parts moving lower, even though the major averages seem to be stuck in the mud. I’ve touched on this topic several times recently, but there is one chart that really drives this idea home. 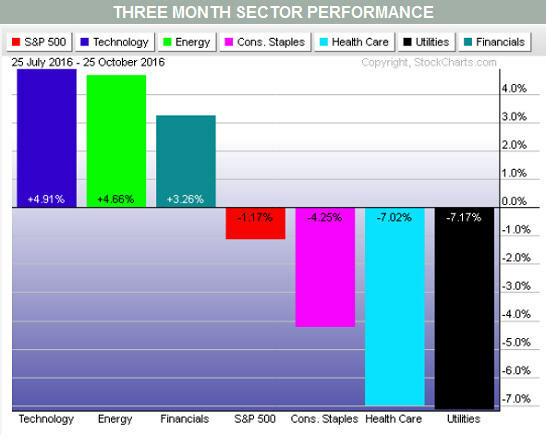 A performance chart of the top and bottom sectors versus the Standard & Poor’s 500 index for the past three months makes it clear (see Chart 1). The S&P 500 is in the middle of the chart, with a 1.2% decline for the past three months. Technology, with a 4.9% gain, is the winner, followed by energy at 4.7% and financials at 3.3%. Lagging are consumer staples, health care and utilities, all sectors I’ve panned here recently. That said, I blew it last week when I panned banks due to several technical failures on the charts. Stocks in that group reversed course within days and several ran to new highs, effectively negating any bearish signals I saw at the time. Putting aside what the charts had suggested, the question is what should we do about it now, if anything? I am a little leery of making any big commitments to the market before the election. But for those who are a bit more adventurous, the idea is to allocate more money to winning sectors and less to losers. As usual, I start with the broad market, and for that I like to look at the New York Stock Exchange Composite index. Although not perfect, I think it represents the “average” stock better than the S&P 500. It is true that the latter covers the lion’s share of market value, but the NYSE index gives a voice to smaller stocks as well. 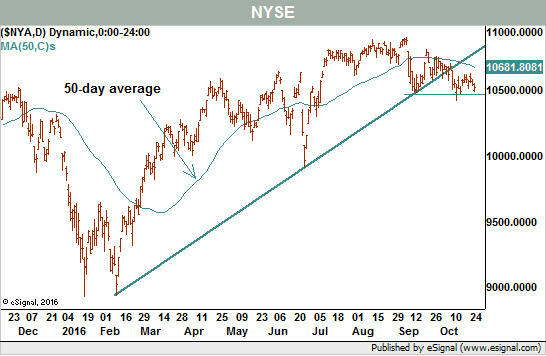 The NYSE Composite is currently in a sideways pattern, with a bearish leaning. It also eased its way through its rising 2016 trendline, which is arguably a break in the trend (see Chart 2). I say “arguably” because a technical break really is supposed to happen on vertical movement — price — and not horizontal movement — time. To be sure, the S&P 500 itself is now hugging its own 2016 trendline, and a breakdown, if it occurs, would suggest a new declining trend has begun. The same is true for the NYSE, as both indexes are poised for nontrivial price moves. The timing on the charts as technical support and resistance features converge seems to coincide with Election Day. 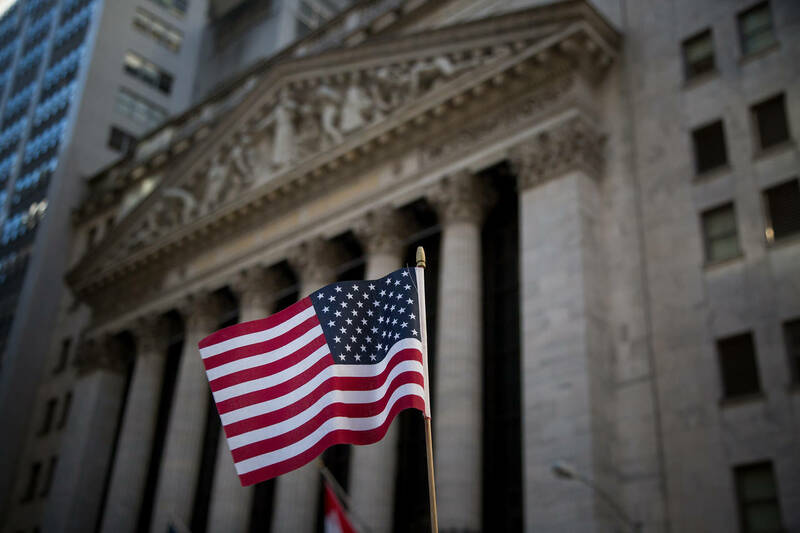 It is not a surprise that the market is floundering now ahead of that historic decision. With the market flat to lower, sectors need only be flat to higher to officially outperform. Indeed, the Technology Select Sector SPDR exchange-traded fund (ticker: XLK) is edging higher at a slow pace. Big components, such as Facebook (FB), continue to pull the weight. 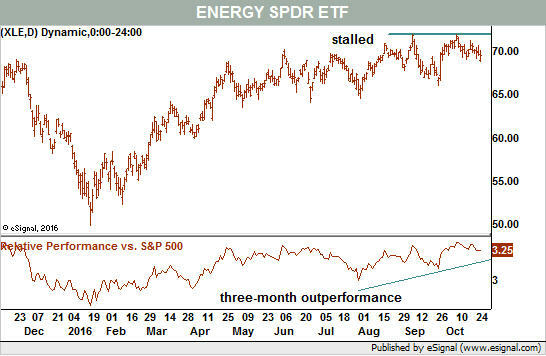 However, even though the Energy Select Sector SPDR ETF (XLE) is beating the market for the past three months, it seems to have stalled (see Chart 3). Of course, it is possible to beat the market by losing less instead of actually making money. That leaves the financials, and specifically the banks, which are beating the market and moving through resistance to new highs. How can they be the third-best performer over the past three months yet be in the best position now? The answer depends on the exact date the comparisons began. This is why we need to combine statistics with chart reading to get the best result. For those so inclined, we can flip the analysis upside down to find sectors ripe for more selling. The three lagging groups would be the places to look for the weakest stocks to either trim from portfolios or sell short. Even if investors take no action now, these groups provide the best places to find stocks to sell should the market break to the downside. Until we get clarity on market direction, it makes sense for investors to move some money from losing to winning sectors. My advice? Sit on the sidelines and watch as the next two weeks play out. Back then, it caused the price of gold to triple. This time, as Casey Report editor E.B. Tucker explains, the cause of the cycle is different…but the results could be the same. Stagflation is the brutal combination of inflation and stagnant economic growth. In short, it means the price of things you buy—like food, fuel, and electricity—keeps going up. Meanwhile, the value of things you own—like stocks and your house—keeps falling. The last time the U.S. dealt with stagflation was in the 1970s. From 1973 to 1975, gross domestic product—economic output—shrank for six quarters. Inflation, measured by the Consumer Price Index, rose from an annual rate of less than 3% to more than 12% by the end of 1974. The price of oil, copper, and gold all tripled. Economists blame that stagflation on the 1970s energy crisis, which caused oil prices to soar. But the so-called energy crisis was due to the inflation of the U.S. dollar, which caused its collapse against other currencies. The oil-producing countries raised their prices in response to Nixon’s devaluation in 1971. This time is different… The upcoming cycle of stagflation is going to be caused by an abundance of cheap credit. 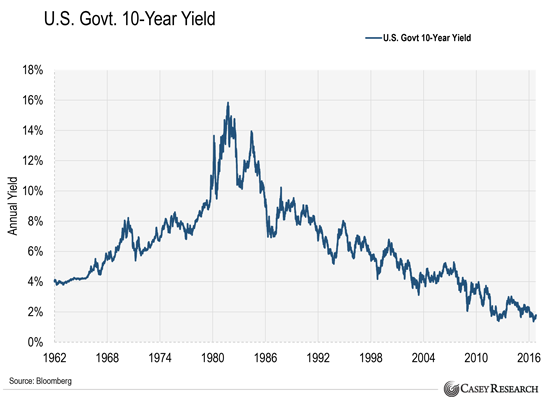 The chart below shows the interest rate, or yield, on the U.S. Treasury 10-year bond for the past 54 years. As you can see, the stagnant growth and inflation of the 1970s caused interest rates to more than double. By 1982, a combination of sky-high interest rates, increased government spending, and lower taxes set off a multi-decade economic boom. In August 1982, the S&P 500 hit a low of 102. It went on to rise more than 245% by the end of the decade. By the end of the ’90s, it was up 1,334% from that 1982 low. That boom should have ended with the dot-com bubble, when many stocks in the sector become overvalued in early 2000… but it didn’t. The Fed stepped in and softened the blow by lowering interest rates. When the Fed lowers rates, it creates cheap credit—which makes it easier for people to buy things with borrowed money. Or even borrow recklessly, living above their means… and making investments that cater to these artificially high standards of living. They’re the small fires that burn back the underbrush of the forest. If you prevent or lessen them, dead wood piles up. And what would have been the next small fire turns into a catastrophic, deadly blaze. But people now accept the Fed as a fixture of the cosmic firmament. In fact, it’s an unnecessary, but necessarily destructive, government agency. The Fed’s interference caused many businesses and individuals to rack up unnecessary debt. Cheap credit and money printing caused a massive investment boom. Look at what happened in the oil market, for example. Billions of dollars rushed in to fund new shale oil drilling technology in the U.S. This doubled production from 5 million barrels a day in 2008 to nearly 10 million today. Now, the world is swimming in oil. And oil prices crashed over 70% from 2014 to early 2016. Cheap credit also caused assets like real estate and stocks to soar. Real estate prices are up across the board while stocks are up 217% from their 2009 lows. Now, these assets are overvalued and approaching bubble territory. But while cheap credit caused massive inflation in asset prices, it hasn’t helped the “real” economy. The U.S. economy is not growing in real terms (which takes inflation into account). It has become stagnant. Last decade’s growth rates—at times over 7%—are a distant memory. Today, economists are happy with 2% growth. Evidence of the weak “real” economy is everywhere. Take Apple Inc. (AAPL), the largest publicly traded company in the world. Earlier this year, the company announced first-quarter sales were less than last year for the first time since 2003. Sales declined again in the second quarter… and are expected to decline in the third, too, although at a slower pace. Apple had no debt in 2003. Today, it has $85 billion. And it’s not just Apple. Other well-known companies like Wal-Mart (WMT), Advance Auto Parts (AAP), and Best Buy (BBY) reported declining sales in their most recent year. In total, 639 U.S.-listed public companies with market capitalizations of at least $1 billion had declining sales compared to one year prior. Last year, the number of companies was only 324. That means the number of companies reporting declining sales doubled over the last year. And it’s going to get worse. To grow sales, a company has two options. Sell more products or charge more for each product. Unfortunately for most companies, selling more products just isn’t possible. Cash-strapped Americans don’t have the money to buy more iPhones, computers, or cars. Remember, the economy isn’t growing. Americans’ pay isn’t increasing. The real median U.S. household annual income is less than what it was in 1999. They haven’t gotten a raise in almost 20 years. Across the country, they’re clamoring for higher minimum wages. And politicians are listening. Earlier this year, the California legislature approved a plan to raise the state’s minimum wage to $15 per hour between now and 2022. And politicians in New York are grandstanding to raise the minimum wage to $15 per hour. The current Federal minimum wage is $7.25 an hour. But a higher minimum wage is really price-fixing. It’s guaranteed inflation. A higher minimum wage will dramatically increase costs, forcing companies to raise prices. You see, you can set the minimum wage at $100 per hour. But companies will merely push those extra labor costs through onto consumers in the form of higher prices. As I just showed you, the economy has become stagnant; meanwhile, inflation is rising. The cost for things we buy every day is about to go up. This bout of stagflation will be very different from what we saw in the 1970s. Companies like Wal-Mart and Best Buy will be using overpriced labor to try to sell goods to a strapped consumer. As sales continue to fall, companies that binged on the Fed’s cheap credit will find they can’t pay their bills and debts. I expect a wave of defaults to clobber the stock market and real estate. But there’s one segment of the market that will shine during this stagflation… gold-mining stocks. Gold held its value in the stagflation of the 1970s. In fact, it tripled in price from 1972 to 1974. It tripled again at the end of the decade. Although the cause of the stagflation is different this time around, the result will be the same. This year, gold has been on a tear. It’s up 20% since the start of the year. Gold mining stocks have performed even better… they’re up 75%. Even after the run-up, gold stocks are cheap. The Market Vectors Gold Miners ETF (GDX)—the popular gold-mining fund—is still down more than 60% from its September 2011 high. 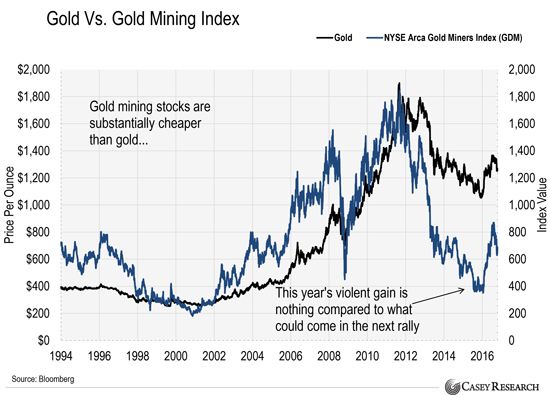 Compared to gold itself, gold miners haven’t been this cheap and hated in three decades. As you can see in the chart below, the price of physical gold fell 45% from its peak in 2011. However, the NYSE Arca Gold Miners Index, which measures the performance of gold-mining stocks, plunged 80%. As I've shown you today, gold prices are poised to soar over the next few years. And gold-mining stocks will perform even better. This is an incredible opportunity. Having the best gold-mining stocks in your portfolio during this time can set you up for once-in-a-lifetime profits. China moved to roll back economic sanctions on the Philippines and ramp up investment in the wake of this week’s Beijing visit by Rodrigo Duterte, who this week promised to distance Manila from the US. One of China’s incentives for Manila involves Mr Duterte’s home town of Davao. On Thursday the China Communications Construction Company, a state-owned group, signed a memorandum of understanding with Mega Harbour Port and Development of the Philippines to conduct a 208-hectare land reclamation project in Davao harbour. The reclamation is expected to finish by the end of 2019. No total value was published for the investment and CCCC declined to comment. In total, the two countries signed 13 agreements on Thursday spanning a variety of economic sectors, while Ramon Lopez, Philippine trade secretary, said the two countries had signed $13.5bn in trade and investment deals. China’s foreign ministry further announced that restrictions on 27 Philippine fruit growers on exporting to China would be lifted, as would a travel warning to Chinese tourists to avoid trips to the Philippines. China Eastern Airlines, one of the country’s largest carriers, announced the launch of a direct air route from Guangzhou to the Philippine city of Laoag, starting next month. 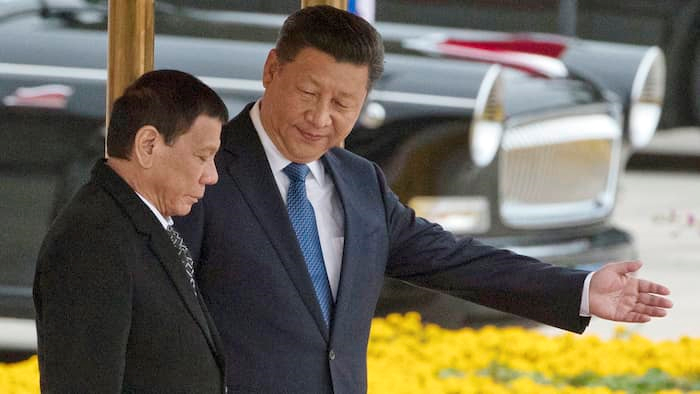 Beijing placed sanctions on Manila in the wake of a 2012 crisis over Scarborough Shoal, a strategic outcrop in the South China Sea that was claimed by Manila, but was seized that year by China. The events caused a decisive break in relations between the two countries, and Filipino fishermen have been prevented from fishing in the area ever since. Mr Duterte and his Chinese counterpart, Xi Jinping, agreed to further talks on fishing rights, even as the Philippine president appeared to surrender any leverage he had over China by all but renouncing a July decision by an international tribunal in Manila’s favour. The court in The Hague ruled that China’s expansive claims in the South China Sea had no basis but Mr Duterte seemed to set the ruling aside, describing it as “just a piece of paper with four corners”. Experts say an offer of Access to the shoal would give China a face-saving way to recognise at least part of the legal substance of the ruling in Manila’s favour. Paul Haenle, director of the Carnegie-Tsinghua Center in Beijing, said there were indications before Mr Duterte’s visit that an agreement could include granting Filipino fishermen conditional access to certain waters around the disputed shoal. “We’ll have to wait to see what was actually agreed on during the meeting and if it can be implemented at sea,” he said.